Hey, can’t say I blame this dog. I can’t tell you how many times I’ve smashed my nose into a freshly cleaned glass sliding door. I’ve also been known to destroy a screen door or two. Perhaps my vision is not as good as it once was? 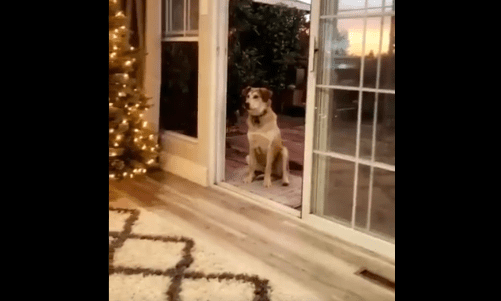 Check out this video of a dog that won’t go through an opened sliding door because he thinks there’s a screen door in the way. The owners have to pretend to open it just to get the dog to come inside. Also, that appears to be a Christmas tree full decorated in that house. Tweet is from November 3rd. That has to be the earliest anyone has set up a tree in the history of decorating for the holidays, no?